An Amber Alert for two missing children in Delaware has been canceled tonight, however their mother is still missing. 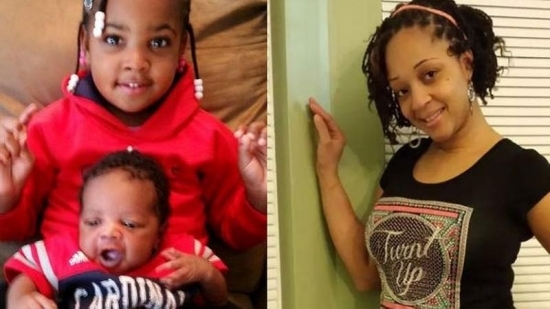 35-year-old Keisha Hamilton and her children, 4-year-old daughter Colette Hamilton and her 4-month-old son Cortez Hamilton Jr., were last seen at 10 pm Friday night at their home at 113 E. Cayhill Lane in the Twin Willows Development in Smyrna, DE. The Amber Alert was put out Saturday afternoon. The children were found safe and sound with their father, Cortez Hamilton Sr., and the alert was canceled at 9:30 Saturday night. Keisha is still missing and a Gold Alert has been issued. Delaware State Police are concerned for her safety and welfare. She is a black female approximately 5’6” and 145 pounds with brown hair and brown eyes. If you have any information please call 9-1-1 immediately or the Delaware State Police. Update 1/11/15 3:00 pm: The children's father, Cortez Hamilton Sr., has been arrested and charged with 2 Counts of Endangering the Welfare of a Child and 1 Count of Assault 2nd Degree with Serious Bodily Injury. Indiana State Police pulled over Hamilton's red 2005 Chevrolet Suburban along Interstate 64 near Jasper around 7:30 pm Saturday. The two children are safe and are currently in the custody of the Warrick County Division of Child Services. Police believe that Hamilton was on his way to St. Louis, MO where is originally from. The children's mother, Keisha Hamilton, is still missing. A 5-year-old boy was injured when he fell from a ski lift at Spring Mountain Adventures in Schwenksville, Montgomery County on Saturday evening. It happened around 7:00 p.m. The boy fell about 30ft from the lift and was flown to Children's Hospital of Philadelphia by helicopter. The accident occurred on a beginner chair lift and there was no malfunction with the lift according to Spring Mountain owner Rick Buckman. The boy was sitting alone and the restraint bar was down. He was wearing a helmet. His condition has not been released. UPDATE 1/11/15:The 5-year-old boy was released from the hospital on Sunday. He had a broken right leg and a few bumps and bruise but is doing ok.
An operational issue involving steam caused thick black smoke and flames to billow from the old Sunoco refinery in South Philadelphia on Saturday. It started around 4:00 pm at Philadelphia Energy Solutions at 3144 West Passyunk Avenue. The smoke could be seen by residents throughout the city. The company says that flames and smoke do not pose a health risk and that there were no injuries at the refinery. Everything was declared under control at 5:30 pm. Authorities have identified a man who was found dead on the front lawn of a home in Northfield, Atlantic County, NJ on Friday morning. 52-year-old Franklin Dwayne Gant Smith, also known as Kevin Charm, was discovered at 11:00 a.m. on Virginia Ave. with a bullet wound to the head. The autopsy has ruled this a homocide. It is still unclear how Smith ended up in this front lawn or even how long his body had been there before being discovered. The investigation is ongoing at this point. Sunday - Low 10, High 37 Partly Cloudy.